I know war and the impact violence has on society, and when writing about the events in this book, I used that knowledge to create something authentic and impactful. 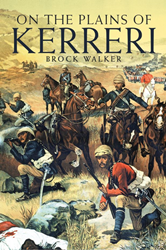 Author, decorated combat veteran and attorney Brock Walker has released his exciting historical saga set in the mid-to-late 1800s that blends fiction and reality to illustrate one Africa’s bloodiest conflicts: The Battle of Omdurman. In “On the Plains of Kerreri,” Walker deftly twines together three compelling characters from around the globe. Syrah, a beautiful, sapphire-eyed African woman whose parents were murdered by a fanatic Islamic warlord, is relentlessly pursued by Arab leaders determined to possess her body and soul. Kip McDuran, a moody young man who was orphaned at an early age and cut his teeth in the small whaling village of Monterey, attends West Point and is recruited by Army Intelligence to take on several dangerous assignments. Finally, the eccentric Winston Churchill learns to survive and then excel using his brilliant intellect and fearless nature in his quest for fame, glory and, ultimately, the office of Prime Minister. As Syrah, McDuran and Churchill become increasingly reliant on each other for survival, the depths of their bonds are tested and the danger, violence and brutality they face becomes increasingly real. “On the Plains of Kerreri” puts forth a brutal examination of a multicontinental conflict that reinforces themes about tribalism, religion and the cruelty of humans, tackles important historical topics like slavery, the slaughter of American Indian people and the exploitation of Chinese immigrants by the American government, and provides readers with an engaging narrative that is accurate to the people and history of the time. Brock Walker spent most of his childhood in Africa. His father was a diplomat posted to Libya, the Ivory Coast and Ethiopia. Walker studied creative writing at George Washington University and earned his undergraduate degree in journalism from the University of Maryland. After college, Walker was commissioned as a navigator in the U.S. Air Force, and while in the military, he earned his Juris Doctorate from the McGeorge School of Law. He left active duty to become a homicide prosecutor in California while also serving as a Staff Judge Advocate in the U.S. Air Force Reserve. Walker is a decorated combat veteran who volunteered for a tour of duty in Iraqi Freedom, Enduring Freedom and the Horn of Africa. He is married with four children, is a volunteer firefighter and scuba instructor and currently resides in Woodbine, Ga.